Did you know that artist Andy Warhol and his Mom had hundreds of cats in their lifetime? That is a lot of cats! Did you also know that all of his cats were named "Sam" except one? What did he name that one cat? See if you can find the name here while you explore Warhol's life and work. If you figure it out be sure to let us know by leaving a comment! 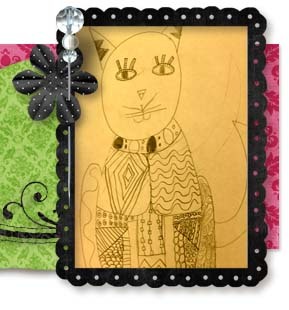 The above 3rd grade drawing is the beginng of our pattern lesson inspired by Warhol's cat illustrations. Be sure to look for the finished projects the next time you are in the building. Our 3rd grade pattern pets are fabulous!